There are only nine village or city governments defined in Ford County. The US Government Mapping Service defines 16 Populated Places in Ford County. The eight "extra" places no longer have post offices or local governing bodies, nor do they appear on modern-day maps. However, they might appear on your old family documents. This is a composite drawn from several sources and may not be totally accurate. It does, however, give a good indication of the relative placement of cemeteries and towns. To view a larger version, please click on the map. Cabery is located on the county line between Ford and Kankakee Counties. The south half was laid out and platted by Chester L. Ames and the north half by Peter Wagner, who owned 80 acres on that side. Cabery was the home of the Eldridgeville Post Office and the Sugar Loaf Post Office. In 1994 the population was 303. Clarence is located in Button Township near Rankin and was also known as Button Station. Derby is located in Drummers Grove near Gibson City West. Elliott is located in Dix Township near Gibson City East. In 1994 the population was 314. Elliott was also known as Elliot Station. Garber is located between Gibson City and Sibley in Drummers Grove Township. Also was known as Garber Station. Drummers Grove Township was the second organized in Ford County and is said to take its name from a small grove of trees, which lies a mile northwest of the present town of Gibson City. Drummer Grove was named for a hunting dog named "Drummer," so called because he was good at drumming up wild game. The population in 1994 was 3,351. Guthrie is located in Dix twonship near Melvin. Aslo known as Guthrie Station. Harpster is located in Drummers Grove near Gibson City West. Harster is in the South West corner of Ford County and was also known as Harpster Station. Kempton is located in the upper part of the county near Cabery. In 1855, Joshua Nicholson came from southern Illinois with a hayrack loaded with 1000 peach trees. He planted them on a rolling hillside three miles northwest of Melvin. The large orchard was cultivated for 12 years. The trees died and were never replaced. 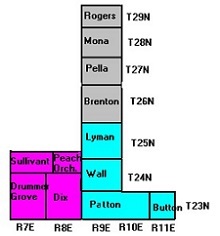 William B. Holmes and John S. Hunt were the first settlers in this area and named it Peach Orchard Township. Paxton is located in Patton Township on the southern part of the County. In 1994 the population was 4,193. Paxton was also known as Prairie City or Prospect City. Perdueville is located in Patton Township just west of Paxton. Was also known as Henderson Station. The first settlers to the Piper City area were Mr. and Mr. John R. Lewis and Mr. and Mrs. Mark Parsons in 1856. When they arrived there were no other houses to be seen anywhere and one could ride 30 miles north without coming across a settlement. The next year a railroad was built in a line almost due east and west across the north edge of Brenton Township. 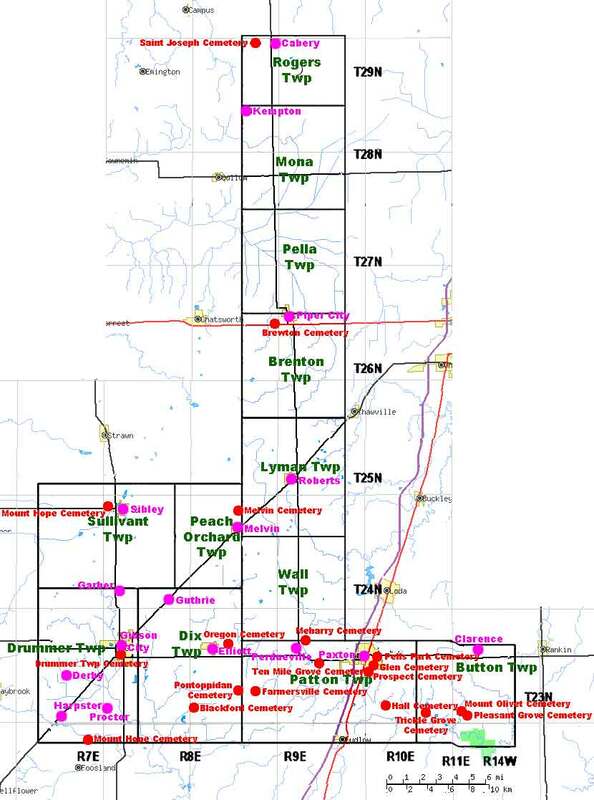 Proctor is located in Drummers Grove near Gibson City West. Roberts is located in Lyman Township. In 1994 the population was 390. And Roberts was also known as Roberts Station. The area around Sibley provides the headwaters of five river systems of Illinois. They are the Mackinaw, which flows to the west, the Sangamon, which flows south and west, the Wabash-Vermilion, which flows south, and the Kankakee and Vermilion rivers which flow northward. All empty into the Illinois River, except the Wabash-Vermilion, which is part of the Wabash system with a branch extending far into Indiana.